Text: To send an anonymous tip via text message to West Kentucky Crime Stoppers, text the keyword WKY and your tip to 847411 (tip411). 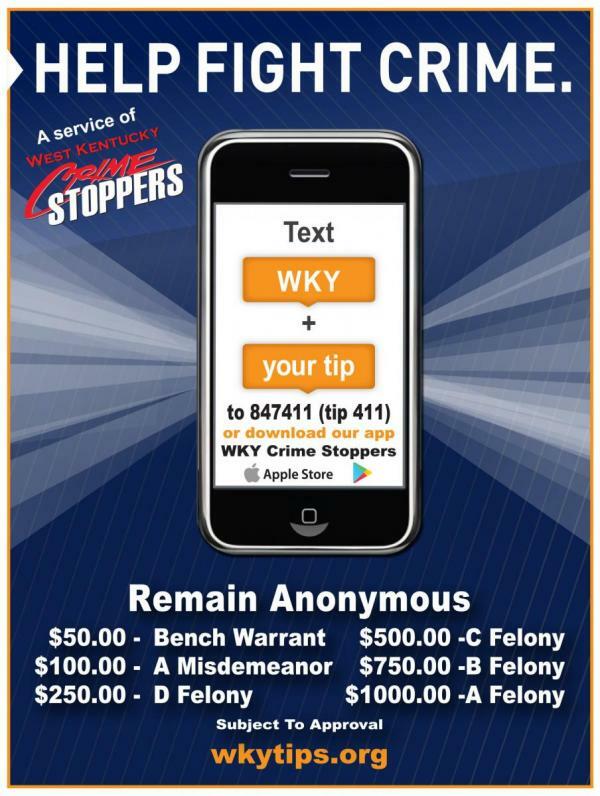 Through App: Download the WKY Crime Stoppers app and send in your tip. The app is free in the Apple Store (for Apple devices) and Google Store (for android devices). Through Webform: Click On-Line Form to submit a secure, web-based form where you can provide information such as suspect description, vehicle information, crime notes, drugs, and photo uploads. Fill out as much as you can. Make a Call: Call 270-443-TELL [270-443-8355]. Phones are answered 24 hours a day. Do you want to receive information from West Kentucky Crime Stoppers? Signing up for alerts is a simple way to receive information. Whether it's vehicle break-ins or endangered missing persons, you'll know about it here first. Crime Stoppers depends upon the citizens it serves to keep our communities safe. By giving you the knowledge of how you can help and what is going on, we can work as a team to solve these issues. Crime Stoppers is 100% Anonymous! Web tips and text tips are routed through secure servers, and the tipster is assigned an alias number. All communication is through this alias. There is no access to the tipster's phone number or IP address. If the tipster chooses to make a telephone tip, the caller identification only shows 270-443-TELL. No caller number can be retrieved. Crime Stoppers tips cannot be placed in a case file to go to court. Crime Stoppers wants to protect the identity of the tipster. Since the inception of West Kentucky Crime Stoppers in 1985 through June 2018, the organization has received more than 5375 tips leading to 891 arrests. So far, 770 rewards have been distributed totaling nearly $190,000. 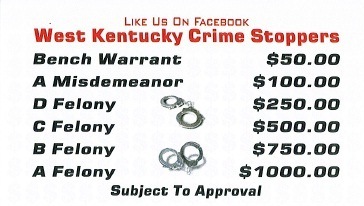 Become a Facebook fan of West Kentucky Crime Stoppers. Please do not submit tips on the Facebook page. This page is to follow information posted by local agencies.